Two Season's under our belt..
Two Season’s under our belt..
Two Season’s at Abigail’s Bed and Breakfast Inn have passed by in a blur. Here we are about to embark on our third and Adam and I are feeling a lot more settled and comfortable. We have finally become fully grown Innkeepers, we are not fledging chicks anymore. Our first full season in 2015 was the 80th Anniversary of the Oregon Shakespeare Festival here in Ashland, Oregon. An extremely busy year for Ashland and of course Abigail’s benefited greatly. A season of learning for us and fortunately we seemed to sail through with very few mishaps. Having great guests added to the ease of adjustment for us. A very big thank you to our guests who went out of their way to review Abigail’s for us on Trip Advisor. 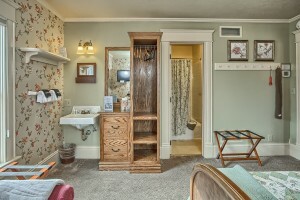 For over a year now we have held on to the No 1 spot on Trip Advisor for Bed and Breakfasts here in Ashland. We did not change too much in the house that year. We felt the need to run through the year to see just what we could do the following year to improve our guests’ comfort and service levels. The following year 2016 was time for change. 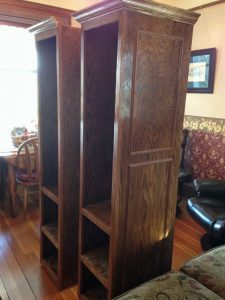 I had always wanted to get rid of the bulky furniture that seemed to clutter our rooms. I also wanted to improve hanging and drawer space. Victorian Rooms. Fortunately I met with a young man who understood my ideas and turned out to be an amazing carpenter. He put his saw to wood and produced exactly what I wanted for each room. Now each room has been de-cluttered. Comfortable chairs for reading have been added. Closet space for hanging clothes have been added as well as dressers, floating bedside tables and coffee tables. Here we are now in 2017 and my final renovations are taking place at this very moment. We are three weeks behind schedule but that’s the price one pays it would seem when undertaking renovations. 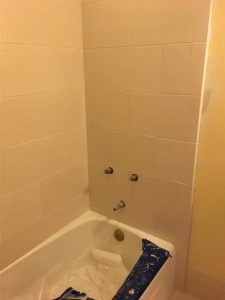 I was determined this year that we re-tile our bathrooms. Adam was a worried man. Rightly so it would seem. However I have to say the end result it worth it. We have re-tiled the bathrooms from the bath to ceiling level, removed the floor covering and replaced that with tiling to match the walls. The result is a cool, clean much lighter space. The tiles are a pale beige and I have matched it with a slightly off white, cream paint. I polished up the brass fittings. Using Ketchup I might add. 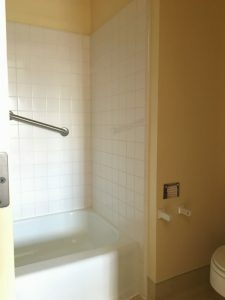 We have replaced the shower heads and purchased lovely new and bigger white fluffy towels for our guests. We have also ordered new carpeting for all of our rooms and hopefully these will be laid in the next few days. New blinds for the windows are coming. They will provide a darker shade and will reduce noise level for some of our more hearing sensitive guests. All in all we are track for what we hope will be a great 2017 Season for us here at Abigail’s Bed and Breakfast Inn and Ashland, Oregon! Be sure to visit our Upcoming Events Page as well as our Activities Page as this will give you up-to-date information on What is Happening here in Ashland, Oregon . This entry was posted in Letters from Abigails by admin. Bookmark the permalink.